Chen ERD - Draw entity relationship diagrams (ER diagrams) easily with Edraw! With an extensive set of library objects, Edraw is a perfect tool for database design and Chen ERD diagramming. 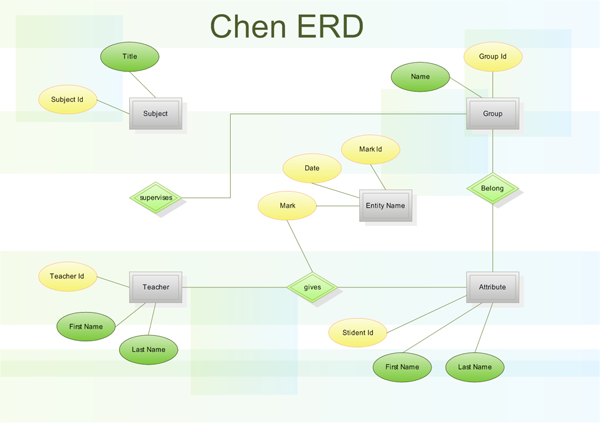 Edraw's insanely fast drawing tools let you easily design your own Chen ERD Diagram in minutes. With an extensive set of library objects such as entities, links, items, attributes, users, types, captions, inheritance, references, boundaries, events, clouds etc., Edraw is a perfect tool for database design and ERD diagramming.